Seriously? Instant Pot Wine – Why is this a thing????? It is not often I have a WTF moment in winemaking however today I was introduced to the concept of instant pot wine. You can read the entire post here but personally I have so many issues with this I’m not even sure where to start. I know he is excited, because making your own wine is exciting and cool but literally nothing he is doing is new or unusual in the grand scheme of winemaking. He has figured out how to use a type of vessel (instant pot) to ferment wine in the most basic sense. He has joined the hundreds of years of winemaking tradition by doing the exact same thing. If you plan to enter the world of home winemaking (which is also not new!) I highly recommend in investing in a couple of glass carboys and airlocks. It takes the same amount of time as this guy’s wine in the instant pot and is easier and likely much cheaper. There are a bunch of wineries around the US that cater to the home winemaker by storing juice for use in home winemaking. If you insist on purchasing store bought juice make sure it is 100% grape juice and that it doesn’t contain preservatives such as Potassium Sorbate or Potassium Benzoate. Other fruit juices can be tricky to ferment at home so I highly recommend starting with grape based juice until enough experience with fermentation is built up to branch out. There were a lot of comments wondering why you had to add the sugar on this post. The reason would be that grapes for grape juice are not picked at the higher sugar levels as grapes for wine. So if you want your wine to have commercial wine like alcohols the sugar is needed. This process is called Chaptalization after the French chemist Jean-Antoine-Claude Chaptal which was first recorded in 1765. In Roman times, honey was used. There are hundreds of types of wine yeast and they are not just limited to Red and White. Go to your local home brewers supply store or look on Amazon.com. It is widely available. DO NOT CLOSE THE VENT!!!! I’m not sure he really emphasizes this enough but this is a huge safety issue. Yeast can build up a lot of pressure and can cause your instapot to turn into an insta explosion in your kitchen. He actually encourages opening and closing the vent but in reality the vent should always be open. I know the instapot is a pressure vessel but don’t take the chance. Another safety issue with home winemaking is CO2 build up. Please do not put the instapot into a confined space where there is not a lot of ventilation. CO2 build up can also be a hazard depending on the volume of the fermentor. Don’t drink a lot of mid-ferment wine. This can lead to some uncomfortable stomach moments. I’ll just leave it at that. There are LOTS of great resources for home winemakers out there that are better than this DIY in a pressure cooker. My time in China continues to influence my life. The most radical aspects have to do with travel. The realization that I could go literally anywhere on the planet and I don’t have to get permission to do so. I can just figure out what it takes to go there, book a flight (after getting visas and shots if needed), and go. 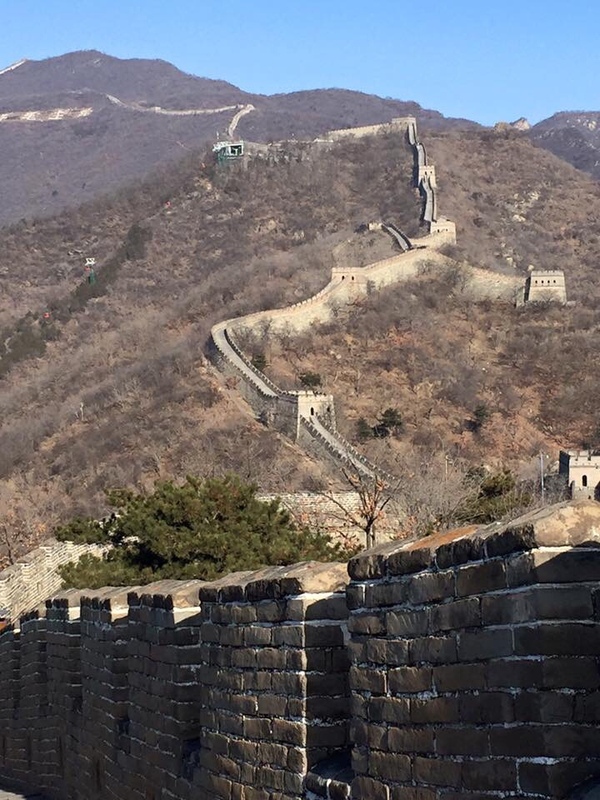 There was something that changed in my mindset as I was standing alone on the Great Wall staring a a sight in real life which I had only ever seen before in my text books in school. I could just GO! The second most dramatic thing that changed was my cooking. I learned so many great techniques and recipes while I was there that I immediately came home and started incorporating them into my life. The most common one is soup. The soup pictured above is my cold busting, sinus opening, warm, good feeling soup. It is loosely based on the breakfast noodles which were a common occurrence during my time in China. It goes something like this. All of the above goes into a medium to large saucepan with a dash of hot sesame oil (add this before the ingredients to the pan while it warms) and sautéed over medium heat until the onions are translucent. Add meat. This can be left over roasted chicken which is what I prefer but I’ve also used deli turkey or sliced London broil which is what went into the photo above. You can also use tofu for a veggie version. After the meat sautés for a couple of minutes pour in enough broth to generously cover the sautéed ingredients. I like to use chicken broth but veggie broth is fine as well. At this point I usually add rice noodles but this time I added some mushrooms. 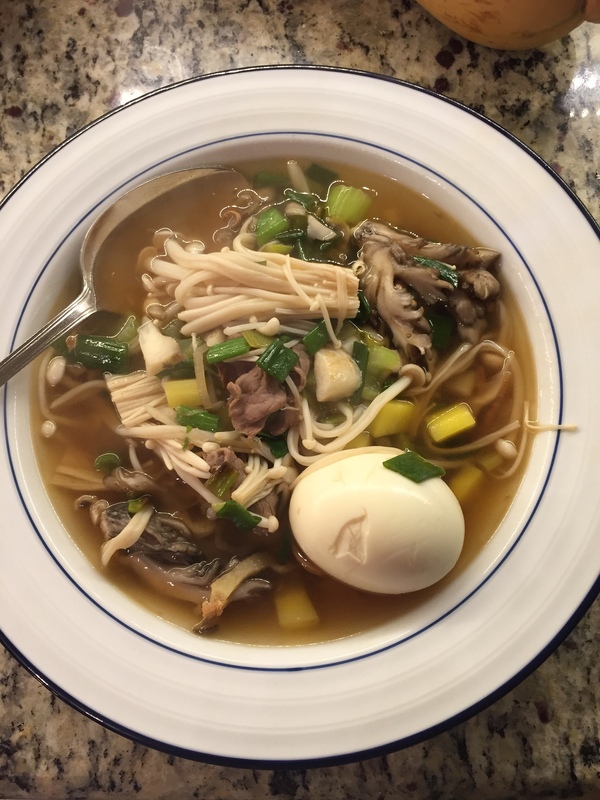 These are Hen of the Woods and Enokitake mushrooms which add extra nutrients and fiber. The Enokitake mushrooms are thin like noodles and gives the same texture. Simmer until the noodles (or mushrooms) are tender. You can also add a boiled egg a few minutes before to warm it up for a very traditional Chinese pairing. Usually these eggs are boiled in black tea. It I just use regular hard boiled eggs. Top off with some Black Vinegar and some chopped green scallions and you are set. There you go. A super cold busting mixture that is very tasty and healthy. Not to mention quick to make. It’s a far cry from the standard take out but oh so delicious.